As fall begins to fall here, quite suddenly I might add, Fraidy Phat the Fish and his new gang are slowing down quite a bit. The pond water tempature has dropped suddenly which signals Fraidy to start getting winter ready. He’s moving much slower and is eating twice as much. He’s like a bear-fish getting ready to hibernate. This will be the gangs’ first winter and although they are all full grown goldfish now the winter tempatures can go on and on and on here making it hard for a greenhorn pond fish to make it. I love these fish (a bit more than what some may see as “healthy”) and am doing my best to help them prepare. I’m feeding them fishfood everyday now, turning on the little pond fountain daily and cleaning out the leaves and things at least once a day. I even made a pond canapy to keep the falling leaves out. I’m also hoping at some point Fraidy will tell them what to do when times get winter-hard: swim to the bottom, stay really really still and wait until it’s warm again. Seems simple enough but I’m guessing their little fish brains aren’t even the size of a piece of lint and so I’m banking their chance of survival on instinct rather than reason. But what kind of instict does a little petstore-bred goldfish have? This is my concern and this is why year after year when the spring springs Fraidy is the only one left standing… or swimming in this case. I have at least another month to fatten them up but then they’ll be on their own. All I can do at that point is wish them luck and hope to see them sometime in March. I was talking to my godmother, Ruth, about the fish and she said she didn’t realize Fraidy was so much bigger than the rest. I guess I’ve never made that clear so I took a few photos for her and am posting them here too. 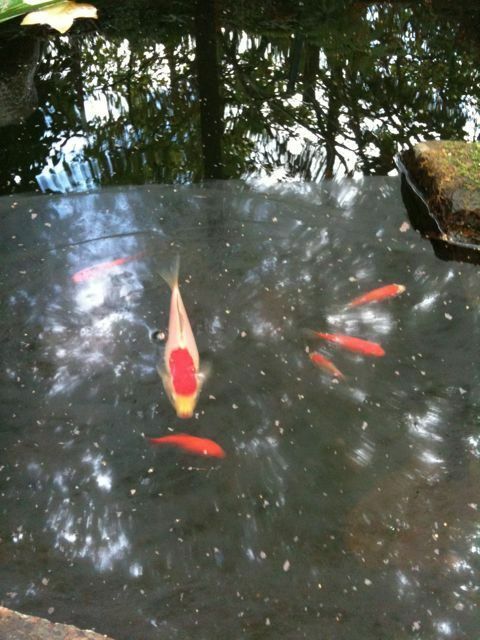 The fish gang are all the size of your average goldfish and as you can see, my man Fraidy is the super sized king of his pond castle. The spot on Fraidy’s head is the same size as the gang members whole bodies…its probably why they hang with him. I love that you called a small group of tiny little goldfish ‘gang members’. I know I called them ‘the gang’ but you made it even more serious… and cuter. They need a group name now. Any suggestions? You can name the gang if you want. Just let me know. Listen to Fraidy, you fools! That’s how you get to be phat fishies! Have you considered bringing Fraidy and his buds inside for the winter? I’m sure Violet wouldn’t bind sharing the bathtub.